Do you have a favorite kitchen tool? A pot or pan, a certain wooden spoon that you ALWAYS use? Well, in the picture above you see my favorite baking tray. I bake, roast and toast everything on it. Non-removable marks of extensive usage are obvious to see. I have several other trays that look much better with less stains, but I prefer to use this one. Anyway, this is a food blog. So let's talk about what's been cooking on my favorite baking tray: butternut squash. I cooked this roasted butternut squash about a year ago for the first time. Back then, I couldn't get the pictures right. So I never got to post it. But it has always been on my mind. The butternut squash is brushed with garlic, chili flakes, thyme and olive oil and then roasted. To be honest, that alone would have got me to post the recipe as it is simply divine. Anything else is a bonus. And in fact, it does get even better. Roasted veggies, pine nuts and a mix of breadcrumbs, Parmesan and goat cheese make this a side dish that looks and tastes absolutely delicious. I can imagine this as a perfect dish to cook when you entertain a crowd. I admit it's a little time-consuming to cook this, but as it will be the same time for two or ten squash halves, it will be worth even more when you have guests to feed. Pulling out a big baking tray with these flavorful vegetables will impress anyone, that's for sure. Cut the squash in half lengthwise and scoop out the seeds. Then cut criss-cross patterns over the cut-side of each one. Mix together the garlic, 2 tablespoons olive oil, chili and thyme and brush this mixture over the flesh. Place on a baking tin and bake for about 30-40 minutes until the flesh is tender. To make the filling, put the courgette, pepper and onion in a roasting tin and drizzle with 1 tablespoon olive oil. Season and roast for about 20-25 minutes until tender and starting to brown at the edges. Add the cherry tomatoes and pine nuts and cook for another 10 minutes. Mix the breadcrumbs, parsley and Parmesan. 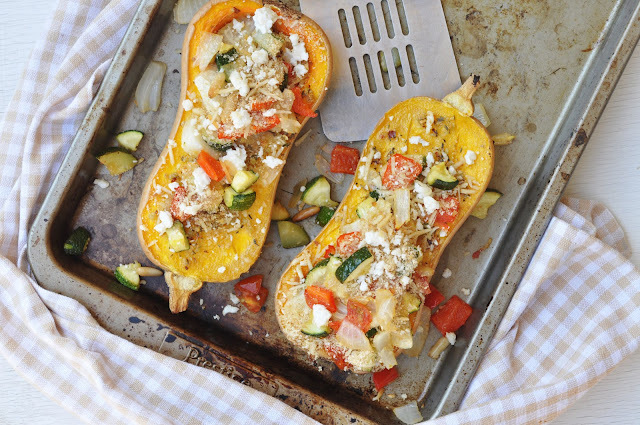 Spoon the roasted vegetables and goat cheese in the squash halves, scatter with the breadcrumb mix and bake for a further 10 minutes or until golden and bubbling. Take out of the oven and serve immediately.